Normally I don't blog about my own music but since the very first copies of my LP arrived at my door today I have decided to post about them. I am super stoked with how they turned out and if you are thinking the packaging looks like an early 90s emo record...well it does. Guilty as charged. *The label is Magic Bullet. *You can buy it from Magic Bullet direct as well as Interpunk and I think Dischord direct. *Retailers - Mordam / Lumberjack should also have this record for sale. *The cover wrap is 12.5" x 19" - silver ink silkscreened on black stock. 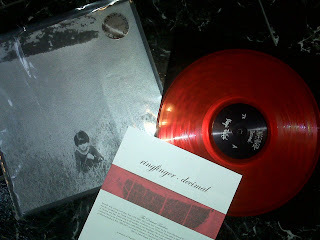 *We pressed 500 LPs total - 251 red vinyl and 249 black. Technically that makes the black more rare! *The record sits in a white dust sleeve which has then been inserted into a black jacket. *The center label: all black and each one has been hand marked in silver ink to say Ringfinger /Decimal and Magic Bullet Records on all copies. *Each record is hand numbered on the inside of the cover flap. *There is a lyric sheet with full liner notes. *The record and jacket are in a clear plastic sleeve which carries a silver sticker that reads Ringfinger Decimal because the front cover does not have any words on it at all. Hooray!!!! And thanks to Magic Bullet! awesome. I will grab one as soon as Brent makes em available. whoa. i might have to buy one in each color - black to play, red to sell on eBay in 20 years. Well - whatever doesn't sell I am totally going to make into record cuffs, ha! I picked up a pressing at Ameoba in Berkeley. Listening to it now. baconfart, what are you talking about? What are YOU talking about, Anonymous? Correction: Rasputin in Berkeley.